Deluxe artwork by Mc-Merc ! Source 1 appeared on Dime, Source 2 was a gift from a generous collector who wishes to remain unknown to everyone, Source 3 appeared on Neptune Pink Floyd. Big thanks go to the 3 tapers of this show and special thanks go to Taper ? for providing the motivation to create this matrix !
" 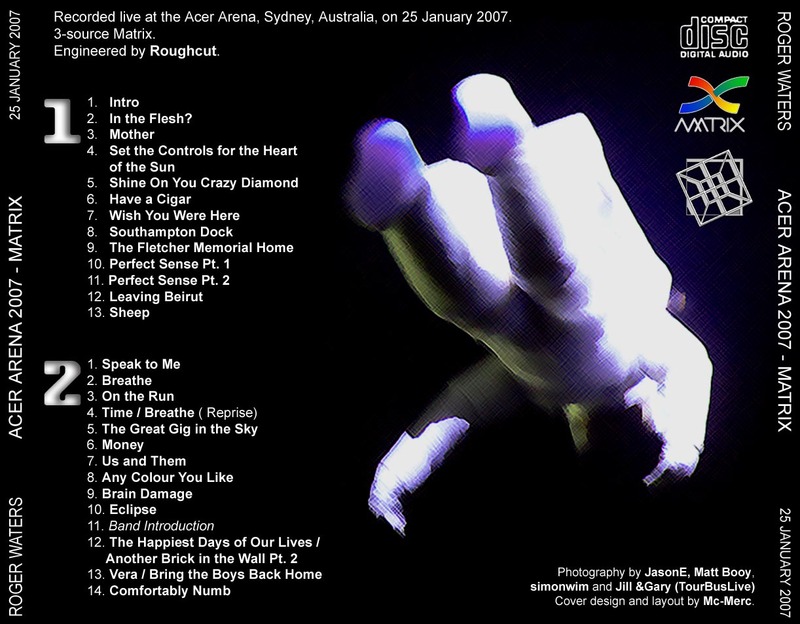 I was a bit hesitant to buy a ticket for this show, because the 2002 "In The Flesh" concert at the Sydney Entertainment Centre left me a little disappointed, with the impression of having listened to an upmarket Pink Floyd cover band. 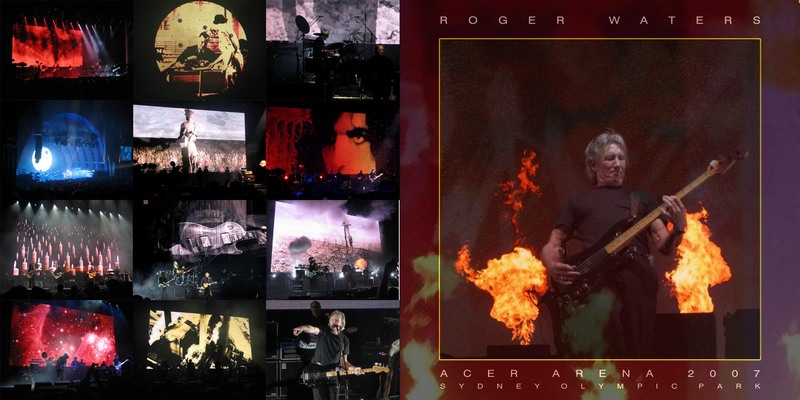 However, this show at the Sydney Acer Arena left me a Roger Waters convert, it was perfect in every sense. 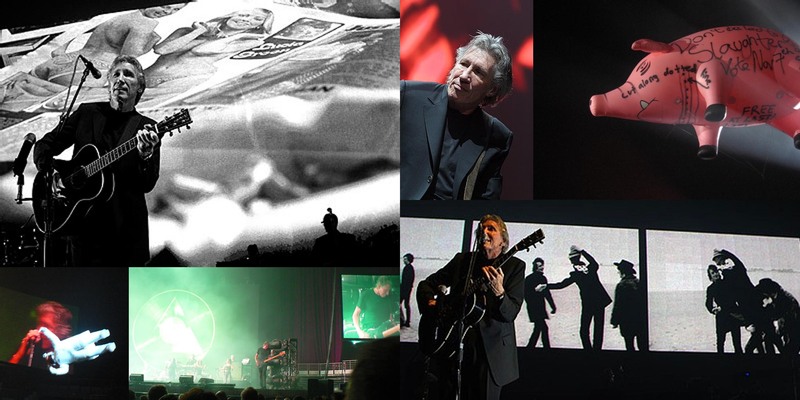 This was the opening night of the 2007 leg of the current Roger Waters tour. The selection of musicians left nothing to be desired, all music was performed with authority and that "Pink Floyd - Blow Me Away" impact. The first set was brilliant, with the remote controlled inflatable astronaut and pig - as well as some of those pyrotechnics - providing real thrills. A memorable moment was when the pig ran out of steam and landed on top of the audience, with stage hands rushing in and - with some audience assistance - bouncing it backstage. Also watch out for that huge onstage explosion with Perfect Sense Pt. 2. With Dark Side the intensity went up several notches. The booming opening heart pulse, the gigantic moon and sattelite, the hypnotic visuals for "On The Run"  with the extra special new sound samples of rushing trains, machine guns, etc., made for an unforgettable experience. The last songs of the album also are invigorated with new punch. 40 minutes stretched to a timeless experience of goose bumps and heart palpitations. The encore "The Wall" experience rounded it all off, but Dark Side Of The Moon was the undisputed star of the evening. The Quadrophonic sound system adds some sparke to the otherwise fantastic - albeit very loud - sound. My advice: If this show comes anywhere within a thousand kilometers of your place - run to get a ticket." 2. In The Flesh ?